I’d like to thank Maureen from Sunshine and Chaos for writing a very emotional post for us. Maureen is on a mission to embrace the new her, a person with an unnamed invisible illness. Her blog is very up beat, and inspirational. I suggest everyone check it out. Maureen told me that she thought this would be an easy post to write, but found it very hard. She said everything about her condition is just so general. “When you not on firm footing you’re just out there flailing.” I think she did a great job! 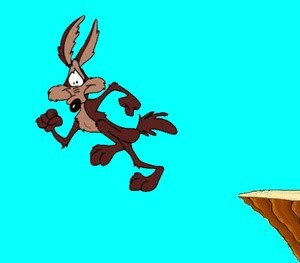 My problem is that I’m in limbo like my friend in the picture, Wile E. Coyote. I have something wrong with one of my ears. I say something because the ENT doctor could only say “it” happens to a lot more people than what is realized and to try to find “a quality of life”. My “it” is balance issues that started in 2000 and my having a chronic illness was finally confirmed by the ENT in 2005. What I have is basically an invisible chronic illness with no name. A “we know how you’re being affected, just not what is causing it“. I feel like Wile does in that picture. On firm ground one minute, in limbo waiting for gravity to take effect the next. I was healthy one minute, living in limbo the next without a specific diagnosis. No specific diagnosis, no possible cure, no plan of action that can help me get back on my feet and be a contributing member of society again. The doctors would always ask me if I would get dizzy and I would say no. A big part of my problem over the years is that I rarely got dizzy. If I did, it didn’t last long and I would attribute it to something else such as getting up too quickly or having a head cold. I did have a few dizzy spells a number of years ago due to water in the ear and I don’t get anything like that. I NEVER FORGOT that feeling of the world spinning. And, I would add, my mother had Meniere’s and I saw how she reacted and dealt with it. What it really felt like at the beginning was “the flu that wouldn’t go away”. Sounds like a bad horror flick, doesn’t it? On my bad days, that’s what it still feels like. I had high blood pressure for the first time in my life, light-headed, slept a lot, no energy, ached a bit, lost my appetite and had a bobbing feeling in my head. Different conditions and diseases were ruled out. The flu eventually went away and also ruled out were chronic fatigue syndrome, mononucleosis, peri-menopause, thyroid, my heart (in the beginning it would beat irregularly and at times fast), brain tumour (I would get a tingling sensation up the back right side of my head that would turn into a headache) and whatever else all those tubes of blood and other tests might confirm. Disequilibrium is a sensation of impending fall or of the need to obtain external assistance for proper locomotion. It is sometimes described as a feeling of improper tilt of the floor, or as a sense of floating. This sensation can originate in the inner ear or other motion sensors, or in the central nervous system. Now that I know that the problem starts with my ear, I believe keeping control of my head movements has reduced most of the symptoms. But they have only been exchanged with other symptoms and side effects. What I get is a woozy feeling, like I’m in a boat and bobbing up and down on small waves. I can be sitting still and it will feel like someone is shoving me to the right. I can stagger like I’m a bit drunk but be stone-cold sober. Changes in the weather affects me so much more. Before, it meant random sinus headaches. Now I start feeling off-kilter and want to stay in bed. Sometimes going for a walk will help me feel better, sometimes a walk only makes things worse. I will pace the hallways of my house just so I can have a “walk” and avoid being far from my bed in case I have to quickly lie down. I have a stationary bike that I use so that I can stay seated and not move my head. I take my cell phone with me on even the shortest of walks, just in case I have to call a cab to get home. On days when I want to, or have to do something, I’ll do it and have to lie down afterward so everything in my head can calm down. And, the rare times when I’m close to feeling “normal”, I sometimes overdo it and then I can easily pay for it for a week afterwards by needing to stay in bed. After all these years, I the person, looking back objectively, can appreciate that in the beginning the doctors couldn’t tell what was going on with me. Everyone, including me, thought it was a really bad case of the flu. But, that idea lasted only so long. I understand that, even as the months progressed, my symptoms were still, general in nature. However, I the patient, wish the questioning went beyond asking “light-headed or dizzy” and included asking about “balance”. I wish I didn’t live in a restricted-budget medical climate where a doctor is not able to order tests based on gut instincts and experience or not have someone else question some of the tests. That actually happened during one of my tests – a doctor questioned why my doctor ordered a test. I have never had a doctor do unnecessary tests. I also wish that the family history of Meniere’s was taken more seriously. My mother had it and I would ask if I had it or if there was a genetic connection. I was always told no but it seems more than a coincidence that a close relative suffered from ear problems. What I really wish is that I had a disease with a name. I could have a fighting chance at treatments or a cure. It would bring legitimacy to what I’ve been dealing with all these years. People deal with illnesses in different ways. I was only in my mid 30s when I first became sick. You’re supposed to bounce back, not stay sick. Some people understood. They were usually the older ones and had friends or family dealing with various illnesses. The younger they were, the more chances that I wasn’t believed. Not being able to be as physically active means that my overall health and stamina has deteriorated. Heart disease and diabetes runs in the family. How has the loss of activity sped up the possible development of these diseases for me? How many years have been taken off my life? How will my final years be lived out? We never know how things will work out in the end, but we don’t want to rush things along. As the saying goes, I truly am sick and tired of being sick and tired. And being in limbo means not much chance of going back to a normal life. There are so many things that Maureen said that rings true, isn’t there? I wrote a post not too long ago about being happy about a diagnosis. Not that I had the disease, but that it now had a name. It is so very hard to have a disease that doesn’t have a name. As Maureen said, it would bring legitimacy to her suffering. Thank you so much, Maureen, for talking about such a difficult subject, and speaking so honestly. I hope someday you get a diagnosis, a name, a cause, perhaps a cure. Sending you healing vibes and gentle (((((hugs))))). Thanks for sharing your story. Although I’m not in the kind of limbo you are Maureen, I do understand a bit the frustration of not having a diagnosis, a cause, or a cure. What I have is the “nots” when it comes to 2 of my chronic pain issues: my facial and dental pain. It’s not trigeminal neuralgia, it’s not tmj, it’s not dental decay, it’s not abscessed teeth, it’s not . . . They are deemed “atypical” meaning no underlying cause, trauma, disease. Time has shown that there is an impingement of nerves in my neck and constant neck spasms that affect my facial pain. By why the neck spasms? Why sleeping in the wrong position give me a migraine and worse facial pain? The dental is rarer but real — called phantom tooth disease because people get the painful yet healthy or completely dead tooth removed, but the pain remains. For years, I was told I should be happy for the nots; it’s only the last few years that I’ve had a doctor who was willing to treat the pain whether it was a not or not. I think frustration, along with anger and fear, are the biggest emotions that I have to deal with. We want to be proactive, whether it’s with our health or different situations we find ourselves in. 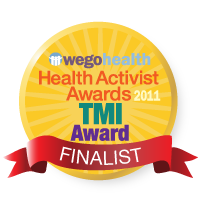 We know that if it wasn’t for our illnesses we would be able to act differently. However, we keep hitting “that brick wall” that we all seem to have in our lives now. I also got a lot of the “nots” which, in some ways, is good. I was told it ruled out things such as terminal illnesses. A lot was ruled out but it still feels like the “nots” are just a drop in the bucket. Probably because there are still so many questions and unknowns. I hope you’re doing better and taking care of yourself. Big healing vibes and gentle hugs back to you. Thanks for shring your story. Happy to share. I’ve learned so much and been comforted by reading what other people have to say, even if they are dealing with other illnesses. You haven’t been posting lately. Hope you are doing OK. Healing vibes and gentle hugs to you as well. I wanted to address the issue of you mom having Meniere’s. I also wonder if some of our ear problems may be genetic. I’ve read some articles that suggest it, but I don’t think there is anything concrete. My grandmother had vertigo and hearing problems. She was never diagnosed with Meniere’s, but *shrug* who knows. I’m lucky in a way that, yes I went for years without a diagnosis for Meniere’s, but I always thought it was something else. Food poisoning, or something. The food issues have been much more difficult to name. But finally, I have names for those too. Now, they don’t know what is causing my pelvic (and shoulder) pain. It may be this, it may be that…I’ve heard that for years, with no one being able to fix anything…or even give it a name. (I’ve had chronic pelvic pain for about 20 years now.) But these things I can live with, could be a contributing member of society. It’s much different when the answer you seek changes your life so very much! I truly hope you can get some answers. But if you never do, do not let anyone invalidate your situation! And you do contribute to society. You help a lot of people. No, we may not bring home a paycheck, but that isn’t how we should be defined. You are an awesome person! My mom is the only relative, that I know of, who has problems with balance/vertigo. I could have sworn that I’ve read somewhere that there is a 1 in 3 chance of developing it if a close relative has Meniere’s. Of course, I can’t find it now. Hopefully, I’ll find it again and be able to look into it some more. It took a while, but I don’t let people get to me as much anymore (usually) about being sick. I think as the baby boomers age, more and more people will have a greater understanding through experiences of their own as to what we went through at a younger age and that is what will bring more legitimacy. Sometimes it seems like if it doesn’t happen to the baby boomers, of which I am one, then it’s not happening. Something like “pictures or it didn’t happen”. But, I’ve accepted that I may never get a full explanation as to what is happening with me, and that’s OK. I have enough information now that I can make appropriate decisions where need be. I don´t really understand why you don´t get the Menières diagnosis. What you describe; the feeling of someone shoving you to one side, the unsteadieness and disequilibrium is something I recognize and I´ve got the diagnosis. Being more tired than usual is also something that follows. I think the brain is so busy with the efforts of hearing and keeping steady that it gets exhausted. Last weekend I took part in a conference for people with hearing disabilities and met others who also have Menières. We have a lot in common but I also found a lot of differences. Maybe in the future researching will divide Menières into different diagnosis. I hope you some day will get your diagnose. Having Menières (or any other chronic disease) is no fun but it´s better to know what youre dealing with instead of being in limbo. I don’t know why Meniere’s wasn’t considered but both ENTs were quite certain that wasn’t the problem. I think you may be right in that Meniere’s will be further divided in the years to come. There is just so many variables that need to be acknowledged. thanks for sharing your story. this line “And, the rare times when I’m close to feeling “normal”, I sometimes overdo it and then I can easily pay for it for a week afterwards by needing to stay in bed.” really hits home with me and it’s something that no matter how hard i try or my doctor tries, i cannot get anyone to understand. and i was a science teacher! 🙂 you’d think i’d figure out how to get the lesson across by now. i’m not trying to complicate things any further. just trying to help. if you’ve already been down this road, then i apologize. i hope you find answers soon. No need to apologize and thanks for the link. It’s how I’m learning. I took a real quick read and it looks pretty interesting. You mentioned hearing loss. That is something that I was tested for and did not have. That may be what is keeping the doctors from diagnosing me with Meniere’s or anything else. I don’t know. It seems like such a big guessing game sometimes. Oops, forgot to add something. What I’ll probably do is go back to the ENT that I saw a few years ago because I can tell him a better description of what I’ve noticed over time, but it’s taking a long time to see the different things. Because the bobbing in my head was from the beginning, I made the conscious effort not to move my head too much so I was unknowingly keeping myself from being able to give a better description of things. Also, I was so tired at the beginning that I was either in bed or on the couch. I lived by myself in an apartment so there wasn’t anyone else to go running after, except my cat, and there is only so much that needs to be done in an apartment. I’m a bit more active now but so much still seems like subtle symptoms at best, which has always been the main problem with me as I know I still can’t do too much. Big, glaring symptoms…easier to diagnose. General and subtle symptoms…not so easy. you’re right that without the hearing loss, it makes meniere’s much harder to diagnose. not impossible but much more difficult. it’s classified as vestibular hydrops. i still think you may want to further look into the migraine associated vertigo route. if you go to http://www.mvertigo.org/forum/index.php and either read along or even join the forum and explain your symptoms, i think you’ll find your symptoms match up with many, many people there. scott, the administrator of that forum is a friend of mine and really knows his stuff. he knows all the medical treatments. i also have a friend “burd” who knows the condition very well and knows some alternative treatments. either way, a good place to go and get more info if you want it. some people, like me, have both. lucky us! Thanks for the link, I’ll check that one out as well. I just found this site at Sparks and was very surprised. I have bilateral Menerie’s which I an attempt to use humor call myself “dizzy broad”..
Now anybody that deals with this knows it is not a laughing matter but it helps me deal with it. Humour is a wonderful thing to have. It gets us through so much and can be shared by so many. Thanks Allison. Isn’t it just a “special” place to be? The doctor, at least, didn’t beat around the bush and send me for further tests that he knew wouldn’t help. The more I’ve read, the more I understand how little is actually known. Hopefully, one day we’ll have a diagnosis that will help us with treatments so that we can feel better. But, until then, sending strength and good wishes right back to you.